I decided to do something different with Sassy's hair this morning. Now I have a couple of other girls who want their hair done this way. this is a very cute hairstyle. I love it! My Granddaughters would love this as well! Oooh that is so pretty. I am definitely going to try this on my daughter! Cute. I'm always trying to think of new ways to style the little one's hair. 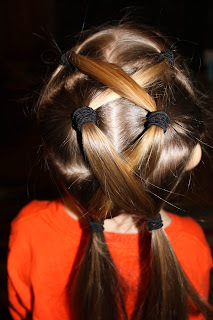 When my girls were small and they would allow me to do their hair, I was always looking for different ways to do the pigtails. Never thought of this one though. Love it.